Not content with their brutal pursuit of the Yazidi and their mass execution of Coptic Christians, ISIS has set about terrorizing yet another religious minority, and this time it’s the Assyrian Christians — members of an ancient church that once dominated the region and have been persecuted practically ever since. On Tuesday, militants stormed ten villages along the Khabur River in northeastern Syria, kidnapping up to 150 people — mostly women, children and the elderly. ISIS plans to release a video today threatening to kill their hostages, according to CNN. The number of kidnapped has been reported with wild discrepancies: after initial reports of 90 individuals taken, most publications have now settled at 150, although the BBC reports that there may be as many as 285 Assyrian Christians currently in ISIS hands. Details as to the hostages’ location are also uncertain, with suggestions that they could be taken to Abdul Aziz mountain, or to the ISIS bastions of Raqqa or Shaddadi. Assyrian Christians are some of the earliest converts to Christianity; the umbrella term is based on ethnicity and comprises five religious denominations. All speak Syriac — a dialect of Aramaic, the language that Jesus would have conversed in — and live predominantly in Iraq and Syria. After the fall of their empire in the seventh century, many of them fled persecution in their homeland to make new lives in Europe, India and Central Asia. Nevertheless, up to 40,000 still dwelt in their ancestral lands in Syria before the war. This is hardly the first time ISIS has targeted a vulnerable religious minority — its hardline Sunni ideology makes apostates of followers of any other sect or religion — but the particular motive for this attack is not yet clear. “These were peaceful villages that had nothing to do with the battles,” a Kurdish official told Reuters. There is speculation that the militants may have been aiming to open a new front against their assailants, to relieve pressure on their military operations after several key losses in the past couple of months. The militants are reported to have referred to their captives as "crusaders," the same term they used to refer to the unfortunate Egyptian Copts. Now we consider it genocide – ethnic cleansing. They are killing our people in the name of Allah and telling people that anyone who kills a Christian will go straight to heaven: that is their message. They have burned churches; they have burned very old books. They have damaged our crosses and statues of the Virgin Mary. They are occupying our churches and converting them into mosques. The most recent violence has prompted observers to warn of the end of the Christian presence in the Middle East. This may sound a little hysterical, but the Assyrians have long been persecuted; they initially settled along the Khabur after fleeing a pogrom in Iraq in 1933. “We are watching a living history and all that comprises [it] disappear,” an activist told The Guardian. This, unfortunately, has been the case for many years. William Dalrymple’s extraordinary 1997 history/travelogue From the Holy Mountain is testament to that, tracing a fascinating odyssey through the shrinking pockets of Orthodox Christianity from Istanbul to Egypt. “It is easy to forget that for over three hundred years — from the age of Constantine in the early fourth century to the rise of Islam in the early seventh century — the Eastern Mediterranean world was almost entirely Christian,” he writes. He notes that despite early intimations of great tolerance, “things are suddenly becoming difficult for the last Christians of the Middle East.” Economic pressure, discrimination, and outright oppression had precipitated mass flight. At the time of his writing, he estimated that 14 million Christians still lived among the 180 million non-Christians of the Middle East. In 2013, I traveled close to the Syrian border, along Turkey’s south eastern reaches, and to experience the majesty of the Tur Abdin — the spiritual heartland of the Syriac Orthodox Church (one of the five Assyrian denominations). 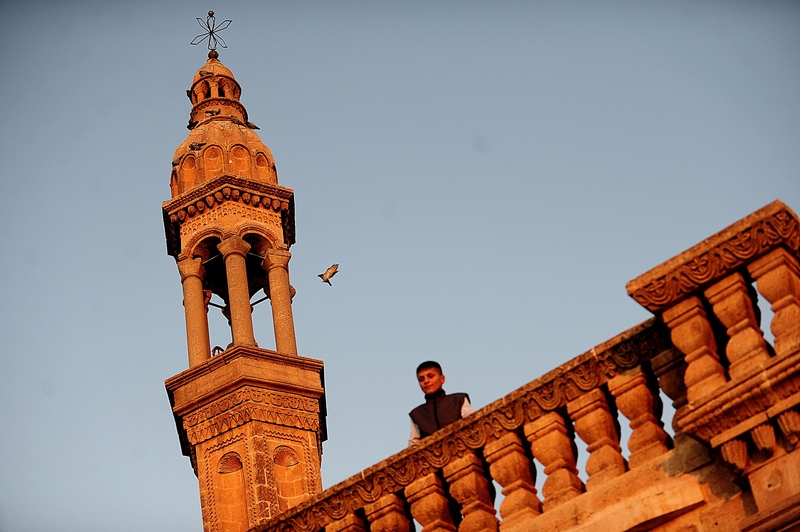 Turkey’s Syriac community have been periodically subjected to cruel persecution, with many fleeing across the border into Syria. When I was there, many were fleeing back — scrambling for safety in the quiet halls of the monasteries, or in the ramshackle suburbs of villages, or the starched white canvas of refugee camps. For the Christians of the Middle East, life has long been perilous, and with the steady march of Islamic fundamentalism, relief does not seem near at hand. Having said that, ISIS doesn't discriminate: It also abducted 100 Sunni Muslim tribesmen from Tikrit early Wednesday.